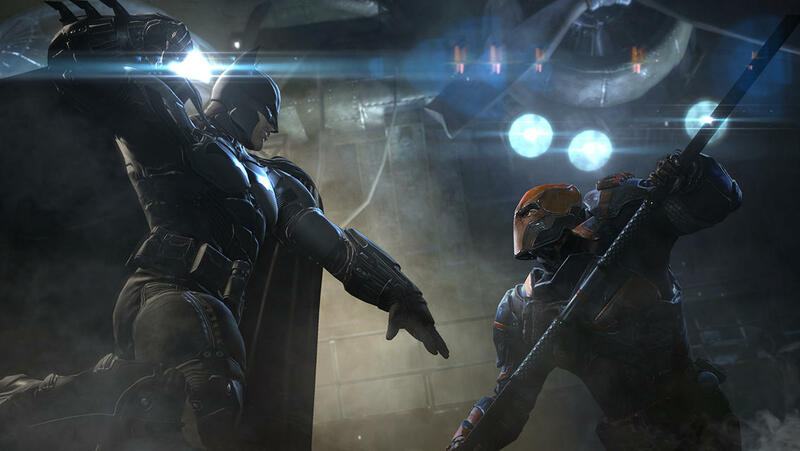 To know how well you're going to like Warner Brothers and NetherRealm's latest superhero action game, Batman: Arkham Origins [Free], you need to ask yourself a few questions. 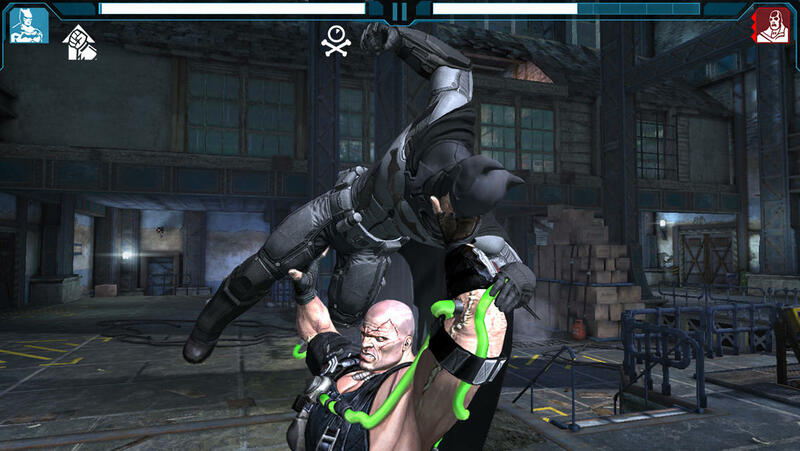 Was the combat in Batman Arkham City Lockdown [$5.99] too complicated for you? Did you find Injustice [Free] had too many characters who weren't Batman? Do you love badly implemented stamina meters? If you answered yes to all of these questions, please smack yourself in the back of the head, and then head to the App Store to download this game, because friend, is this one for you! Well, look, it's not all bad. The game looks great, is packed full of stuff fans will dig, and the gameplay isn't that bad while you're actually playing. There's a clear evolution to the games coming out of NetherRealm on iOS, however, and it's not a very pleasant one. At this rate, I expect their next game to just be a Batman virtual pet who threatens you if you don't toss money in after every ten minutes of tapping to level up. In case you didn't know, there's a new Batman Arkham console game coming out. It's got a new developer and looks a little uninspired compared to its stunning predecessors, but I'm sure it will turn out good enough, since they're following the blueprint left behind by Rocksteady. It has some spin-off titles, too! The 3DS and Vita are getting a side-scrolling action/adventure in the vein of Metroid, developed by people who formerly worked on Metroid Prime. It looks pretty nifty, which leaves me with one question to which I'm pretty sure I already know the answer: why not that one for iOS gamers? 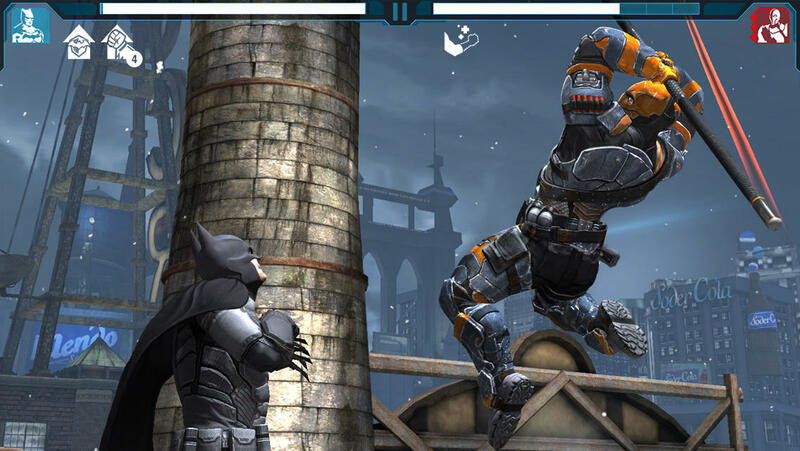 Batman: Arkham Origins iOS is, in concept, similar to Lockdown. You go to various locations in Gotham, you fight a series of thugs one at a time, and occasionally a proper super villain shows up to engage in fisticuffs with you. You earn experience points and currency, which enable you to power up Batman and unlock new abilities and suits. This makes you stronger and more able to handle the next wave of baddies. Where it differs is that while Lockdown was very clearly aping Infinity Blade [$5.99], the combat here is a simplified version of Injustice. Don't worry about dodging left or right, don't worry about whether you're using strong or light attacks, just tap-tap-tap to success. 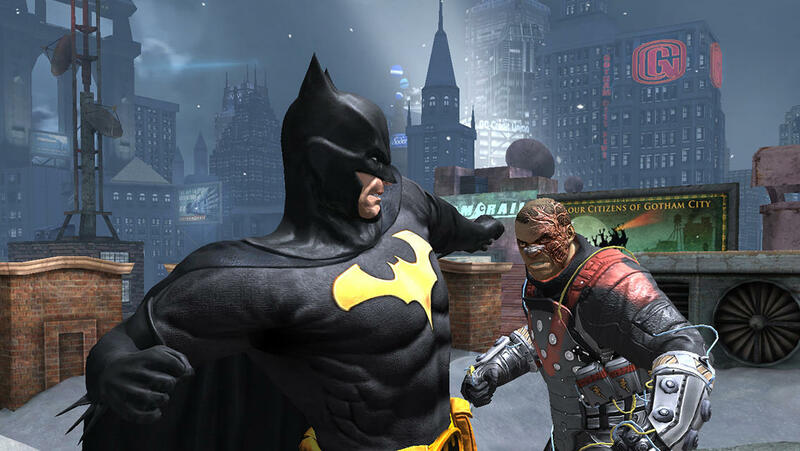 The main addition to the combat here compared to Injustice is the ability to change Batman's stance. As you play, you'll unlock a variety of stances, each with access to their own unique special moves. You'll need to make the most of these special moves depending on how the battle is going. Also welcome is the addition of a block button, though if you still want to use the awkward two-finger touch block from Injustice, you're free to. Like that game, the special moves require a variety of QTE-like responses, and some of them are really cool. The combat is fast and thanks to decent sound effects, hits have a nice feeling of impact, but in terms of strategy, there's not much here beyond blocking when the enemy tries their special move, firing off your specials when they're ready, and tapping the screen for your regular attack otherwise. Super villains bring a few new tricks to the battle, but, like your special moves, they're essentially QTEs. You'll have to tap circles or swipe along an arrow to avoid their powerful special attacks. If you're successful, you'll have a chance to do a little extra damage, but if you fail, you'll take a heavy blow. Like Injustice, there are sometimes conditions put on the battles, such as constantly draining life, reflecting damage back at you, and so on. It's a really straight-forward battle system without much room at all to offer depth, but it's decent enough. The story has you playing as a younger Batman, and as far as I can tell, a hit has been called on him for one night only. Eight super villain assassins come out to try their hand at taking down the Bat and winning a reward. Gotham is carved up into regions on your stage select map corresponding to each assassin. Each region houses a variety of missions, eventually culminating in a fight with that region's assassin. There are also side missions which can be repeated as often as you like, usually with the aforementioned special conditions in place. So, you choose a region, choose a mission, and that'll send you to the arena where the fight takes place. You're basically just pummeling mass quantities of bad guys again and again to level up your Batman. The sad thing here is that I really like leveling up my Batman. It's fun! I like collecting his special abilities, suits, and gadgets. I love watching his stats go up as I use a thug's face as a punching bag. It's simple, but it appeals properly to the Batman fan in me, so as a game, it actually works fairly well. Ten minutes at a time, anyway. Like a lot of free-to-play games these days, Batman: Arkham Origins uses that most dreaded of monetization techniques: the stamina bar. Used well, a stamina bar is a minor annoyance, but if it's implemented thoughtlessly, it's almost a game-killer. The best case scenario for a stamina bar is where it's a real showstopper in the early going, but as you acquire more superheroes/cars/suits/llamas, it becomes less of an issue due to being able to swap between said collected goods. This is the way stamina ended up working out in Injustice. Batman, Superman, and Green Lantern need to take five, but hey, Bane, Joker, and Flash are all set to have a wacky adventure. The worst case scenario has a fixed stamina bar that you cannot get around without paying. There's no swapping to another character, no jumping in that extra car you keep around. Nope, your stamina is gone, and you are going to pay up or wait, no matter how far into the game you are, bucko. Guess which type Batman: Arkham Origins uses? A kewpie doll for the red-headed gentleman in the back row who guessed the latter! Yes, it turns out the tireless Caped Crusader, the man who will pursue crime doggedly until it fades whimpering in the night, the guy you call when all the chips are down and even Superman's got nothing, gets a wee bit tuckered out after a few fights. He's going to need a sit-down, to the tune of about two hours for his full meter. There's a perfectly fair way this could have gone down, with each of the suits having a stamina meter like Gameloft's Iron Man 3 [Free], but that's not the way NetherRealm went here. As a result, no matter how long you've played or how many suits you've collected, you're still only going to get 3-5 battles before you have to put the game down. A fate so ghastly not even Jason Todd deserves it! That's the worst monetization aspect of the game, but it also uses dual currencies, and the second currency is very, very scarce in-game. Like Injustice, you can log in with your WB ID here to get a free unlock, and if you connect it with the console version, more unlocks will mutually follow as you play each game. I don't have the console version yet, so I can't say if the unlocks are awesome, but going by Injustice, they're probably worth the trouble. Curiously, there's no Game Center support in the game, which is another way the game negatively breaks the pattern from previous titles. In the end, I find Batman: Arkham Origins to be a very frustrating piece of software in multiple ways. Perhaps unfairly, I don't like that even though the hardware is capable of more, we keep getting these increasingly cut-down experiences from Warner Brothers. However, even taking the game for what it is, I'm annoyed that instead of getting a similar treatment as Injustice, where the monetization hooks were somewhat reasonable, the screws have been given another healthy crank to the point of ruining what would otherwise be a decent enough game.